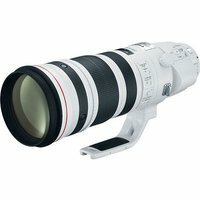 The Canon EF 200-400mm f4 L IS USM lens with Internal 1.4x Extender is a top-flight lens developed primarily for professional wildlife and sports photographers who desire finest possible results and finest possible lens. Uncompromising in design ethos, lens possesses 33 elements in 24 groups and features fluorite coating, sub-wavelength coating and Ultra-low Dispersion (UD) technologies, ensuring colours remain sharp and precise throughout lens' range. 1.4x extender makes lens highly versatile and is activated via a flick of a lever - extending focal length to up to 560mm. Of course a lens of this calibre features very best in image stabilisation and auto-focusing technologies, while magnesium alloy chassis is light, tough, durable and designed to operate in difficult wear conditions; providing you with quality images for years to come.